Our High Speed Copier Tabs are 100% guaranteed for accurate collating, assuring you of the highest productivity possible, and an end product you can be proud of, time after time. These High Speed Copier tabs are available in Cartons or Individual Boxes. Blank Index Tabs and Laminated, Imageable Index Tabs can be used as a quick and cost effective way to enhance and customize your presentation as well as organize any job. 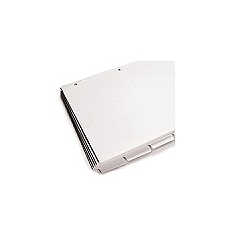 These High Speed Copier Tabs are designed to run on high-speed copying and duplicating systems. Style 1000 – Popular, economical plain paper tabs. Style 2000 – Paper tabs with reinforced binding edge. Style 3200 – Durable copyable mylar tabs with a unique, glossy, toner-receptive plastic tab covering. Print right on the surface of the tab using your print-on-demand system to quickly create tabs that look like traditionally printed custom indexes. Style 4200 – Durable copyable mylar tabs plus a mylar reinforced binding edge. After you choose the style tab, you have to pick the size. The tabs come in 1/3, 1/4, 1/5, 1/6, 1/8 and 1/10 cut tabs are stocked. Our High Speed Copier Tabs are certified SFI (Sustainable Forestry Initiative). Companies that purchase large volumes of paper have become increasingly aware of the impact their buying decisions have on the environment. This consciousness was raised as environmentalists focused on paper mills and the landowners who cultivate the raw materials. Our goal is to provide more environmentally and socially responsible printed products! If you have any questions or are interested in purchasing the High Speed Copier Tabs, visit us at SpiralBinding.com. We have great pricing on a full line of Index Tabs and Dividers. Call us at 1-800-631-3572 for more information!